California is well-known for having some of the most beautiful beaches in the world, but when we think of California beaches, our minds tend to drift towards Pacific Coast locations like Venice Beach and Malibu. However, it's important to not forget that California has some wonderful inland beaches too, like on the shores of the stunning Lake Tahoe, which also crosses over the state border into Nevada. Lake Tahoe is the biggest alpine lake in all of North America and has around 71 miles of shoreline in total, being a hugely popular recreational area for people in both states. All sorts of activities can be enjoyed at Lake Tahoe, including winter sports, summer fun in the sun, kayaking, sunbathing, hiking, and more, and there are plenty of beautiful beaches to be found all around the lake. One of the best things about visiting a Lake Tahoe beach is being able to sit back and simply admire the breathtaking natural beauty of the lake itself. Lake Tahoe is a must-visit location for anyone in either California or Nevada. The area is home to a lot of exciting recreational activities and is the West Coast’s closest competitor to the Great Lakes in terms of sheer size and natural beauty. There are plenty of great beaches to be found all around Lake Tahoe, both on the California side and on the Nevada side. Read on to learn all about the very best beaches at this location. Sand Harbor Beach is found on the Nevada side of Lake Tahoe and is one of the best beaches within a relatively short distance of nearby Carson City. Every part of Lake Tahoe is beautiful, but Sand Harbor Beach is extra special. Huge boulders and bright blue waters decorate the landscape here, with alpine trees and stunning views in every direction. This Lake Tahoe beach is a beautiful spot for swimming and there's even a cove for scuba divers to explore. Not only that, but Sand Harbor Beach also has its own visitor center, as well as picnic areas and a boat launch site. It's one of the most popular beaches on Lake Tahoe, so you can expect to see big crowds on sunny days, and it's definitely worth a visit. This beach also hosts the annual Lake Tahoe Shakespeare Festival for visitors who are interested in hearing some beautiful poetry to accompany their beach trip. If Sand Harbor Beach is perhaps the prettiest beach on the Nevada side of Lake Tahoe, Baldwin Beach is its Californian equivalent. Located on the lake's southern shore, this family-friendly beach stretches out for around half a mile and offers some unbeatable views of the lake and surrounding landscapes, dominated by the impressive Mount Tallac. Like many south shore locations at Lake Tahoe, the water at Baldwin Beach tends to be very warm and welcoming, so it's perfect for swimming. You can also try kayaking at this location, with rental services right nearby, and there are picnic tables and grills too for people who want to cook up some treats on the beach. Pope Beach is located on the southern shore of Lake Tahoe and stand sout for the huge swathes of tall pine trees that can be found just off the beach itself. All of these huge trees offer nice little pockets of shade on the beach, so this is a great option for people who want to enjoy the beauty of Lake Tahoe without burning up or risking sunstroke on a summer day. There's nothing quite like sitting in the shade of a tall pine tree and looking out over the lake, admiring the glimmering reflections on its surface and the distant mountains beyond. Lots of benches and picnic tables are found at this Lake Tahoe beach too, so there's always a comfortable spot to sit down. 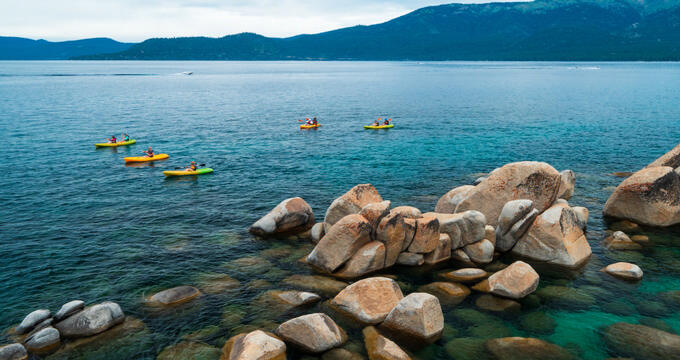 Kayaks and paddleboards can be rented at Pope Beach as well, offering a fun option for visitors who really want to get out on the water and experience Lake Tahoe in a very special way. Lester Beach is actually situated within the D.L. Bliss State Park, over on the western shore of Lake Tahoe. The state park can be a super spot to explore for all kinds of recreational activities, and this beach is a real highlight, offering a stunning swimming area with beautiful blue waters and some stunning views. Kayaking and stand-up paddleboarding is very popular at this location due to the calm nature of the water and the large open spaces, but Lester Beach is also a nice spot to simply relax on the sand with a good book or some fun beach games. The only problem with this beach is that parking is quite limited, so you'll have to hope to find a spot or risk parking further away and having to walk. Commons Beach is situated in Tahoe City itself, making it one of the more crowded beaches on the shores of Lake Tahoe. It's a very popular spot with families and young visitors, and there's a beautiful park right nearby with grassy areas and shady spots to cool off on sunny days. This beach also features a play area for the youngsters and lots of benches and picnic tables for groups of friends or families who want to enjoy some food together without risking sand in their sandwiches. There are some really impressive views of the Sierra Nevada mountains at this particular Lake Tahoe Beach, and the proximity of Tahoe City offers a lot of amenities to make your stay as enjoyable as can be.